In development for four years before receiving a stealth launch during The Game Awards, A44's Ashen is at once a beautiful Souls-like and its own beast. Some may disagree with Ashen being classified as an overlooked game. After all, it’s been in development for years, and has made several appearances at E3. That’s all true. Also true is that developer A44’s new action-adventure-RPG-Souls-like debuted at the tail end of the year with the deck stacked against it in some ways. A44’s—and presumably Microsoft’s—decision to release Ashen during The Game Awards could be perceived as a bad move. The show was a three-hour tumult of announcements and award winners, and many viewers treated the yearly event as a way to kill time until midnight EST when Super Smash Bros. Ultimate kicked and punched its way onto the Nintendo eShop. Yet the more I consider Ashen’s stealth release, the more it makes sense. Players like me, who would drop anything to immerse themselves in any Souls-like, let alone one as haunting and beautiful as Ashen, were bound to rush to their computers and queue up a download through the Epic Games Store no matter what else was going on in the gaming world. But what about the rest of the gaming world? What about you? Have you played Ashen? If not, you’re missing out on one of 2018’s standout games. That’s saying something. This year has been stacked, especially in terms of indies. But there’s something special about Souls-likes, especially one crafted with as much TLC as A44’s. More so the Souls-like that get their influences right. In fact, slapping a “Souls-like” label on Ashen is disingenuous. 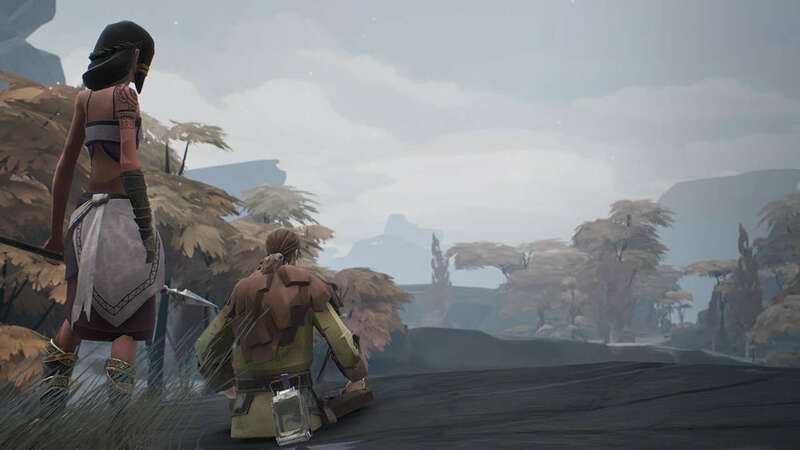 In the hours I’ve spent with Ashen over the past couple of weeks, it’s revealed a medley of influences: the passive multiplayer of Journey, where human companions slip into the boots of your NPC companions as quietly as Ashen slipped onto the Epic Games Store earlier this month; the satisfying weight of Dark Souls combat; exploration as intoxicating as Zelda: Breath of the Wild’s, which may come as a surprise to Souls fans expecting Ashen’s world to be the next Lordran or Yarnham. In Ashen, NPCs can be controlled by AI or human players. But Ashen is more than a sum of its influences. The game’s art style reminds me of construction paper, all colors and hard edges that meld into bleak tableaus of a dead world slowly coming back to life. Its faceless characters are symbolic of the fact that no one is anyone because the passive multiplayer system allows anyone to be anyone at anytime, if you see what I mean. And if you don’t, you should play Ashen. You have no excuse, really. Set aside all the loud triple-A games that glut physical and digital stores this time of year, sign up for Xbox Game Pass or pay developer A44 its well-deserved $40 on the Epic Games Store, and immerse yourself in one of the year’s best games. I've only played a handful of minutes with it but I really enjoyed the aesthetic and it looks like a combat system I'm really going to like. My only negative towards it was the amount of time to reload after dying (Which was a lot longer than a game where I'm going to die a lot should be). As for overlooked, yup. Absolutely perfect fit for this category. There's an amazing dungeon crawl section around 5 - 6 hours in called The Seat of the Matriarch. It is like they made the old Ultima lore and instruction books come to life. High point of the game. Hrmmm... Maybe? But nearly zero marketing for the last year and a bit + a relatively stealth release during the VGAs ain't going to push you into the spotlight. It's pretty good, but I have no reason to play through it again due to the cardboard character/weapon/armour. There's very little difference between runs.